We are expanding our SkyTouch relationship through this exclusive agreement with our Signature owners because it’s one of the most innovative PMS programs we’ve come across. It enables our members to have access to a strong, secure and easy to use system. SkyTouch Technology, an industry-leading hotel property management system (PMS) provider, and Vantage Hospitality Group, Inc., a top ten global hotel company with over 1,200 hotels, signed an exclusive agreement today. The deal unites the lodging industry’s highly-rated and most widely used cloud-based PMS with Vantage’s newest and most innovative brand yet; Signature – the only lifestyle/boutique hotel brand available for both conversion and new construction. SkyTouch, which actively serves more than 6,000 hotels, is a preferred vendor for Vantage and many of its hotel brands such as Americas Best Value Inn, Country Hearth Inn & Suites, Jameson Inn and Lexington by Vantage. This new agreement further solidifies SkyTouch’s preferred PMS position, while simultaneously helping to secure Signature’s operational success. SkyTouch has been a Vantage preferred vendor since 2013, was named Preferred Vendor of the Year at Vantage’s 2015 International Educational Conference and Trade Show, and rates a 9.65 out of 10 in customer support satisfaction score according to the most recent customer survey. These accolades are due in no small part to the company devoting substantial resources to continuously develop their cloud-based system; an investment which allows SkyTouch to consistently upgrade and aggressively refine their product. SkyTouch keeps in close touch with the ever-changing lodging industry by engaging with customers, conducting interviews, surveys, and attending industry events, all in an effort to help hoteliers rapidly solve real operational problems now and in the future. With more than 6,000 properties, SkyTouch Technology is the most widely used cloud-based property management system, designed to help hotel companies meet their most important strategic objectives: enhancing guest experience, advancing performance, and achieving growth, while evolving with changing market needs. Accessible from anywhere, SkyTouch provides visibility and control of operations through real-time, impactful business analytics that improve hotel guest experience, operational decision-making and financial results at the property. For more information about SkyTouch Technology, visit http://www.skytouchtechnology.com. 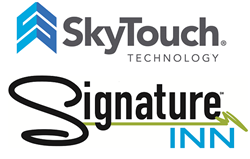 SkyTouch, SkyTouch Technology and SkyTouch PMS are proprietary trademarks and service marks of SkyTouch Solutions, LLC. About Vantage Hospitality Group, Inc.
Vantage Hospitality Group, Inc., has been recognized as one of the most progressive hotel companies in the history of the lodging industry, and is the only hotel company to be ranked among the Inc. 500/5000 List of America’s Fastest-Growing Private Companies for eight consecutive years. Supported by the resources of a franchise and the freedom of a membership organization, hotel owners around the globe have embraced Vantage’s philosophy that puts control back in their hands, allowing them to be “In Business for Themselves, Not by Themselves.” Vantage Hotels is among the top 10 hotel franchisors based on the number of hotels in its system, with over 1,200 properties worldwide. Whether a property is a member of Vantage’s legacy brands, the award-winning Americas Best Value Inn brand (with its sister brands, Canadas Best Value Inn and Value Inn Worldwide) and the ground-breaking Lexington by Vantage, or of the Jameson Inn, Country Hearth Inn & Suites, or Signature Inn brands, all Vantage Hotels members enjoy the opportunity to maximize their revenue and asset value through Vantage’s low fees and reasonable contract terms; flexible, straightforward agreements; A Voice and A Vote® in major brand initiatives; the most comprehensive resources, support and CRS in the industry; sensible PIPs, and a culture that is centered on educating, not mandating. Membership in Vantage brands in the United States is offered (as a franchise) through Vantage Franchising, Inc., and in Canada, through Vantage Franchising (Canada) Inc., wholly-owned subsidiaries of Vantage Hospitality Group, Inc. For more information, visit http://www.JoinVantageHotels.com.